When Blizzard announced that they would introduce rotating formats to Hearthstone, they also remarked that Basic and Classic cards would remain playable in the upcoming Standard format that otherwise rotates card sets out on annual basis. In order to achieve this, there would be changes – in practice, nerfs. Now, we finally know all the nerfs that are coming to Basic and Classic cards for the year of the Kraken, the first Standard rotation. So, let’s dive right in and look what the changes are and what they might mean. 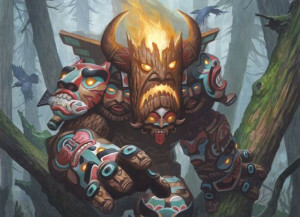 Aggro Shaman, or Face Shaman, is one of the most recent deck archetypes introduced into Hearthstone. While it traces its roots to Mech Shaman, it was the League of Explorers and especially the Tunnel Trogg that was released in it that gave life to this highly aggressive deck. The early story of Aggro Shaman was covered on Liquidhearth when it was brand new, but it has since evolved, especially so in the past few weeks, so it is a good time to take a look at this cheap and effective deck. When the deck was covered on Liquidhearth, builds still had two distinct directions. Luffy’s Overload style and Reynad’s more mech-based approach. In the next few weeks after the article, Luffy’s core emerged victorious as a faster and more stable variant. What is the best way to spend real money on Hearthstone? Hearthstone is a free-to-play collectible card game. If that sounds strange, collectible card games are known to cost a ton to play, after all, it kind of is. Hearthstone does live up to its name in the sense that if you play a lot, you can actually unlock everything in the game for free and even have a full collection. Typically collecting cards for free involves becoming a good Arena player and playing Arena a lot for the rewards as other means of collecting in-game gold and cards are rather slow. However, you really need to be a good player to benefit from Arena, as with mediocre performances you are better off simply buying card packs instead of Arena access with your in-game gold. So, let’s say you want to improve your card collection a bit faster or just don’t have the time or dedication to grind for everything – games are played for fun, after all, and if you have the means to have fun faster, why not go for it. You are probably still interested in getting a good deal though, so what is the best way to spend real money on Hearthstone? Rogue is a peculiar class in Hearthstone. It has never really been a mainstream class – the closest it got was pre-nerf Miracle Rogue – but even then its representation was not representative of its power level. Throughout all this time, however, Rogue has remained viable and enthusiasts insist on playing it both on ladder and in tournaments. The latest successful example is Dog’s second-place finish in the Insomnia57 Truesilver Championship. Rogue was also part of Amnesiac’s lineup in his first-place finish in the Americas Winter Championships 2016, part of lineups of both Orange (winner) and SuperJJ (second place) at Dreamhack Leipzig in January 2016 as well as part of Ostkaka’s World Championship winning lineup at Blizzcon 2015. Clearly podium finishes are not strange for the class. I have written before about the multitude of deathrattle minions that will be leaving the Hearthstone Standard format upon the release of Whispers of the Old Gods expansion. 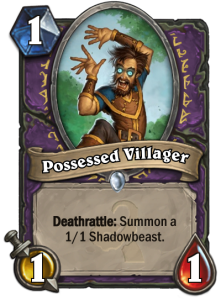 Two days ago one of the replacement cards was announced: Possessed Villager, a Warlock class card one mana 1/1 minion with a deathrattle to summon another 1/1 minion. As sticky boards have proven to be a formidable asset in Hearthstone, any cards with summon effects as their deathrattle are highly interesting. So, how good is the Possessed Villager? The Warlock Zoo deck is a combination of three elements. First are the efficient minions to claim the board. Second are the buffs which enable trades. Finally is the Warlock Hero Power to keep the engine running. The Zoo concept that will never be completely out of fashion. Playing more cards than your opponent always creates opportunities and the Warlock Hero Power is ideal to support such a game plan. 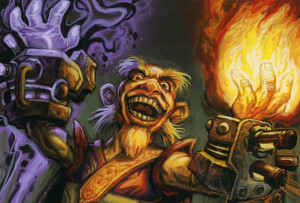 Zoo decks existed in Hearthstone already before the first expansion – and while the Shieldbearers, Shattered Sun Clerics, and Harvest Golems were replaced – the archetype itself is still alive and kicking. The fortunes of Zoo have varied, but it has always been present. Right now, Zoo is living its golden age, and is one of the strongest decks for many players. Both Midrange Druid and Secret Paladin are weak to an aggressive board control strategy. Given the popularity of these decks there is plenty of prey for Zoo to hunt. The Druid population also keeps the greatest nemesis of Zoo, Freeze Mage, at bay.